In a world that often tells people to conform to the “normal” singer Nora Collins is encouraging you to walk to the beat of your own drum. Her song “Plain Jane” reassures listeners that they are perfect just the way they are and that what’s inside their hearts is what truly matters. “Plain Jane / No there ain’t nothing plain about your heart / Hey hey hey, Jane someday you’re gonna shine just like a star / For being who you are / You’re gonna be okay / Plain Jane,” she croons in the chorus. The lyrics poured out of Collins from private experiences with her own self-doubt and uncertainty. “This song came from a personal place. I wrote it on a day when I wasn’t feeling good enough,” the Wisconsin native explained to Sounds Like Nashville. “I needed the reminder that everyone is on their own journey, and to have faith that God has plan for everyone. I hope that anyone who has ever felt like this will connect to the song. The message and personal touches of the tune were made even more special with the inclusion of Vince Gill, who lent his vocals to the track. 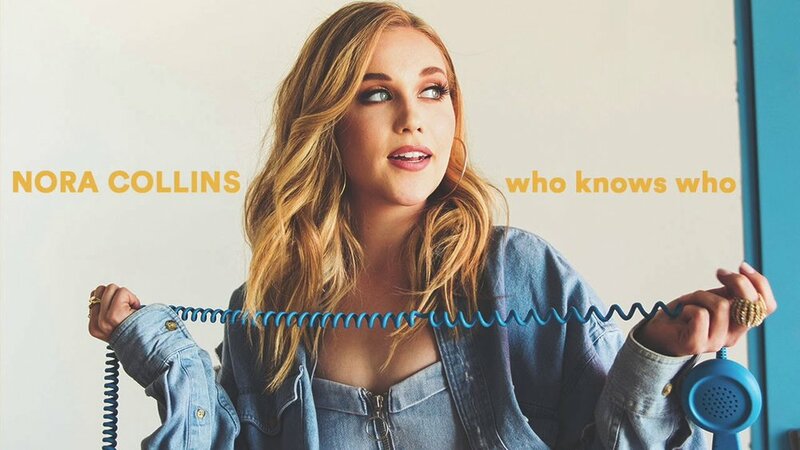 “Plain Jane” will be featured on Collins’ upcoming EP, featuring her songs “Who Knows Who” and “Backseat Falling.” She has spent time out on the road, opening for acts including Trace Adkins, Dustin Lynch, Justin Moore and others. Keep up with Collins via Facebook, Instagram and Twitter. Country newcomer Nora Collins says that the aim of her new single "Backseat Falling" – which Billboard is premiering Thursday (Aug. 16) – is to take one back in time a bit. "It's a song about reminiscing about your first love. It's one of my favorite songs from the upcoming EP. The track turned out so cool. I wrote it with my friends Aby Gutierrez and Clay Mills, and (producer) Marshall Altman did an amazing job in bringing the right vibe to the song and bringing it to life." Working with the man behind hits from Frankie Ballard and Amy Grant has been a learning experience, she tells Billboard. "I admire his work a lot. It's been fun to be in the studio with him and collaborate with him and to learn with him. He's been great, and has really pushed me to be involved in the process. He's been open to my suggestions, and we have spent a lot of time with pre-production on all of the songs. I love what he does. I really enjoy getting to work with him." Collins hails from Milwaukee, Wisconsin – though she has been a resident of Music City for over two years now. A publishing and artist development deal with MV2 Entertainment brought her to town to stay, but before that she had been traveling to Nashville once a month to build her contact base. However, the road life is nothing new to her, she says. "Before I moved to Nashville, I was playing over two hundred shows a year – five years in a row," she says. "I've been doing this for a long time, and am very excited to be in Nashville pursuing my dream. I just signed with WME, so now I have a major booking agent, and am so grateful for all of these opportunities and excited to share my new music with people." Moving away from home was a risky move, but she says it's one that she's glad she made. "I had grown up in one house, and never moved before, so when I moved to Nashville, it was the first time for me to be away from home. So, there were a lot of life lessons that I learned and a lot of growing up that happened, but I love Music City, and I love getting to write every day with hit songwriters, so a lot of growing has happened to me in a short amount of time." Though she moved to Tennessee, you can't truly take the Wisconsin out of her. She confesses that she still bleeds Packers green and yellow. "I was raised that way, and will forever be a Green Bay fan," she says, adding that she has been able to become friends with one of the team's all-time greats. "Just last week, Donald Driver – who is a former Packer – had a charity softball game, and asked me to sing the National Anthem, and then play a little bit. Being a fan, that was a really cool experience for me, getting to play with some former NFL and NBA players, as well as his Dancing With The Stars friends. It was a really cool day." Collins has yet to perform the National Anthem at the iconic Lambeau Field, but says it's on her bucket list. What is it about the Green Bay Packers that endears them to their fans? With pre-season action just starting, Collins has her ideas. "We're not a fair-weather team. We are very invested in the team – emotionally as well as financially. The team is owned by the fans, which makes it a unique organization. I feel like Wisconsin is a state that is proud of everything Wisconsin, but especially the Packers. We rally behind our own, which is something I love about our state." With two minutes on the clock, and a drive starting at the twenty, do you go with Brett Favre or Aaron Rodgers? She is definite on her choice. "Aaron Rodgers," she says emphatically. Read the full article on Billboard.com. Nora Collins perfectly captures the emotions behind the romantic games people play in her catchy-as-it-can-be new single, "Who Knows Who." The rising young singer-songwriter pairs a playful, fun bed track with a lyric that has more than a bit of edge to tell the story of a young woman who's out drinking and "doing who knows what with who knows who" to send a message to the man who has treated her the same way. She's "thinking 'bout you / Doing who knows what with who knows who / And the only reason I'm doing this is 'cause you're doing it too." Read the article on Taste of Country. The Alzheimer's Association, Southeastern Wisconsin Chapter recognizes Nora Collins as a champion. "This is a cause very near and dear to my heart," says Nora Collins. "Honored to be a champion and help raise awareness." To find out how you can help #EndALZ, please visit www.alz.org. Nora Collins recently joined the CMT Artist Discovery campaign as the network debuted her single "Recover" on November 1. Nora has received eight Wisconsin Area Music Industry (WAMI) Award Nominations and three wins including 2014 WAMI “Singer/Songwriter of the Year” and two consecutive WAMI “Rising Star” awards (2012 and 2013).